Justin says the pair have been in the studio working on his 20/20 follow-up. In a new cover story from Variety, Justin Timberlake says he's been back in the studio working with Pharrell. According to the article, the "Rock Your Body" collaborators will reunite on songs "with an eye on" an as-yet untitled fifth studio album. 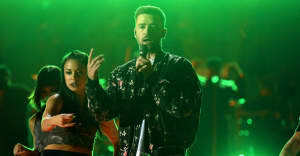 The news follows an Instagram post from March, in which Timberlake hinted at the collab by posting a photo of the two in the studio together. Being that the piece runs in Variety, the discussion also centers on Justin's work on a variety of film projects, including new films from Woody Allen and Jonathan Demme, plus Disney's new Trolls movie. There are also some quality anecdotes about Justin doing Justin-y stuff, like "a capella beat-boxed renditions" of Frank Ocean songs in a crowded restaurant. Read the full story here.